Why doesn’t my income on my Home screen match the my Income tab? One cool feature in Hurdlr is the ability to set your projected business income, rather than actual income, in order to see different tax and profit estimates. This is especially helpful if you run a seasonal business with uneven earnings throughout the year. To change from actual to estimated business income, tap Taxes > settings (gear icon in top right of the screen) > Use My Estimate. 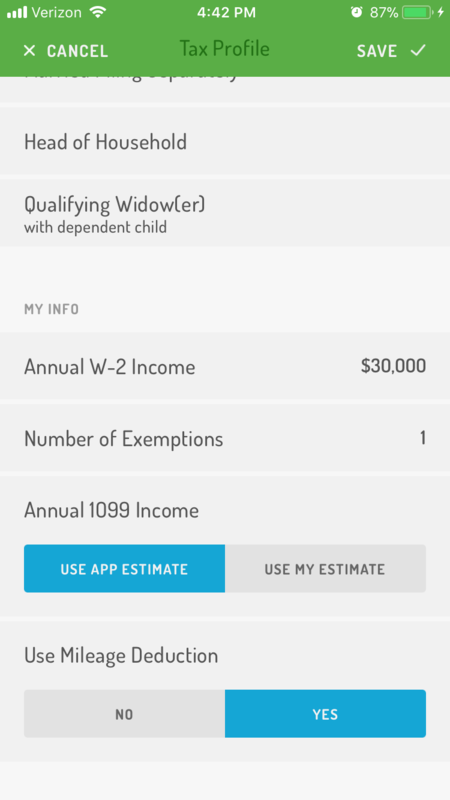 If you select to use your own estimate, the app will use the prorated annual income amount to estimate your taxes and display on the Home screen. When ‘Use App Estimate’ is enabled, the app will use actual income and expense data entered in your account to calculate profit and tax estimates.